The world of a plant can be a stressful place. 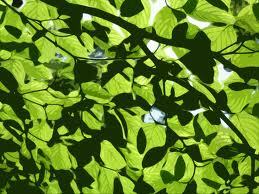 Many plants constantly compete with their neighbours for light by elongating to try and get out of their shade. In crops, this elongation can dramatically reduce agricultural yield and so is a major limiting factor in how densely a farmer can plant a crop. Scientists at Royal Holloway, University of London and The Centre for Research in Agricultural Genomics, Barcelona have been studying the effects of this shade avoidance and are hoping to eventually impede this response to increase planting density. Using a fast-growing "model plant" the scientists searched for individuals which showed a heritable loss of this response. To do this, they inserted a bioluminescent "reporter" to follow the activity of a shade-responsive gene in living plants. They simulated shade by adding extra far red light and found that they could observe the plant glowing within as little as 20 minutes after the treatment. Using this system they were able to screen through thousands of plants to identify a number of plant strains that they have called dracula strains, which show no avoidance of shade. The study is published in the Journal of Experimental Botany. Dr Paul Devlin from the School of Biological Sciences at Royal Holloway explains: "Shade avoidance is a major limiting factor in how densely a farmer can plant a crop. If plants are too close together then the shade avoidance response kicks in and they become too tall and spindly to produce a good yield. The new dracula strains we've identified in this model plant show a greatly reduced response and we hope that, ultimately, these plants can give us clues as to how we might also attenuate this response in crops."